KaVA(KVN and VERA Array) is a combined VLBI array with KVN (Korean VLBI Network) and VERA (VLBI Exploration of Radio Astrometry) operated by Korea Astronomy and Space Science Institute (KASI) and National Astronomical Observatory of Japan (NAOJ), respectively. KVN is the mm-wavelength VLBI facility in Korea. It consists of three 21 m radio telescopes, which are located in Seoul (Yonsei University), Ulsan (University of Ulsan), and Jeju island (ex-Tamna University), and produces an effective spatial resolution equivalent to that of a 500 km radio telescope. KASI has developed innovative multi-frequency receiving system, observing four different frequencies at 22, 43, 86, and 129 GHz simultaneously. With this capability, KVN will provide opportunities to study the formation and death processes of stars, the structure and dynamics of our own Galaxy, the nature of Active Galactic Nuclei (AGN) and so on at milliarcseconds (mas) resolutions. VERA is a Japanese VLBI array to explore the 3-dimensional structure of the Milky Way Galaxy based on high-precision astrometry of Galactic maser sources. 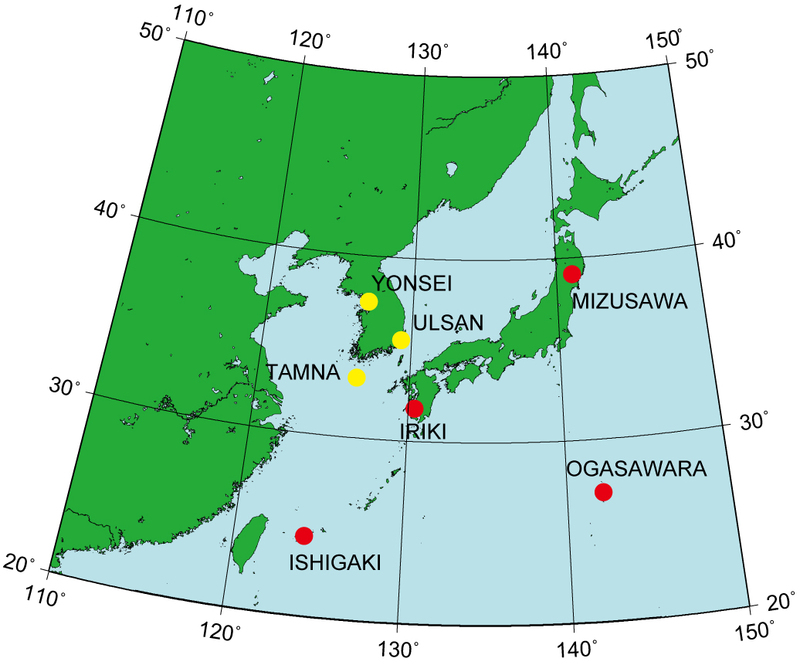 VERA array consists of four 20 m radio telescopes located at Mizusawa, Iriki, Ogasawara, and Ishigakijima with baseline ranges from 1000 km to 2300 km. Most unique aspect of VERA is “dual-beam" telescope, which can simultaneously observe nearby two sources. While single-beam VLBI significantly suffers from fluctuation of atmosphere, dual-beam observations with VERA effectively cancel out the atmospheric fluctuations, and then VERA can measure relative positions of target sources to position reference sources with higher accuracy based on the ‘phase-referencing’ technique. KaVA was formed in 2010, on the basis of the VLBI collaboration agreement between KASI and NAOJ. KaVA complements baseline length range up to 2270 km, and can achieve a good imaging quality.